Barter is the exchange of goods or services for other goods or services. It is a buy-sell arrangement where cash is not used as the intermediary. For example, a sign company may do vehicle graphics work for a radio station in exchange for radio advertising time. This page describes how to approach handling barter within Cyrious Control. The approach described here does NOT require the Accounting Module for Control. **A Note On Sales Tax**: Just because a transaction is non-cash does not exempt it from sales taxes. In most (all?) states, you are responsible for paying sales tax on barter transactions as if it were a cash transaction. The approach laid out here does not alter the normal sales taxes you would owe. If you are unsure of the tax law for your state, consult a local CPA. The basic approach used here is to realize that a barter transaction is equivalent to a Customer Credit being applied to the order. Create a new bank account in the Chart of Accounts in Quickbooks/Peachtree with a name of Barter. Click Add to create a new account, fill in the details as shown below. Account Number: This is optional, this will appear on the balance sheet report within Control. External Account Name: Barter (this name must match the exact name of the Barter bank account you created in your accounting package). External Account Desc: This is optional and for your information only. Click Save on the right side toolbar. Click New to create a new payment method, fill in the details as shown below. Image: This is optional, you may select the one you prefer. 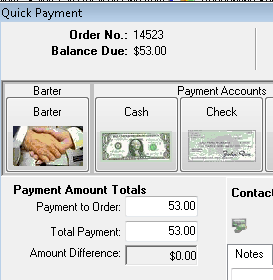 To post a barter payment on an order, just click the Barter payment option on the Quick Payment screen. Enter the bill into your accounting package, set the expense account on the bill equal to the normal expense account you would use if you were paying this bill by cash, check, credit card, etc. When you pay the bill, you should pay it from the Barter Bank Account you created. When you export to QuickBooks/Peachtree the Barter Bank account will be debited (increased) by $50. You receive a bill from your vendor that you are bartering with and it is for Lawn care for $50. When you create the bill you add an expense line on the bill for $50 and choose Lawn Care Expense as your expense account.